Sustainable Sunshine Coast Architecture does not require driving a Prius or growing a beard. Sustainable design and green building design in general have become meaningless buzz words of the last decade , every company from BP (British Petroleum) to Amazon Books (ironically no doubt contributing in no small way to de-foresting the real Amazon) they all seemingly insist in recent years to be some how saving the planet via some bizarre ‘green wash’ logic, even the organisers of Festivals such as Splendour in the grass offer carbon neutral credits, while at the same time filling fields with plastic bottles and various other needless landfill. The majority of these green claims are massively erroneous, blatant lies or at the very least empty platitudes, bandaid solutions used as marketing exercises. There has been, however some great advancements in the architecture and the built environment industries in recent times; websites such as Eco Specifier home of leading independently verified sustainable products, Ecospecifier has an online database of more than 6,500 products listed, that are ‘green alternatives’ to standard materials making it one of the world’s most expansive sustainable resources. An invaluable education tool and life-cycle assessed product information source to consult when designing your new home on the Sunshine Coast, Ecospecifier links independent, un-biased information with a user friendly search interface. Ecospecifier does your sustainable products research for you delivering innovative housing products, sustainable architectural solutions based on your specific needs. It is a resource I suggest all my clients look into especially those with allergies or environmentally inclined. Other sources for legitimate green housing innovations and information can be obtained through websites such as the aptly names Treehugger website and Inhabitat are also great sources for both information and inspiration. Another great sustainable building design resource is the work of renowned Professor Janice Bikeland author of ‘Positive Development: Vicious circles into virtuous cycles, which was a textbook of mine at uni when studying architecture and sustainable design. I was lucky enough to have Prof Birkeland as both a lecturer and tutor and learned a great deal about simple passive interventions such as Tromb walls, green scaffolding retrofits and solar chimneys. 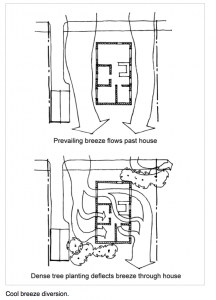 By incorporating basic natural ventilation strategies, your house is far less reliant on ‘active’ mechanical systems such as fans and the dreaded air conditioner to cool your home in summer. The addition of correctly placed fins or planting to channel the prevailing summer winds is one such way to easily reduce both your electricity use and also naturally cool your residence. As a rule of thumb on the Sunshine Coast the predominant winds in summer you want flowing through your home are the North East and South East winds, these are cooled across the ocean (air passing over a body of water is the basic principal of air-conditioning) The winds you generally try to avoid are from the west which pass across the hot arid interior before they reach us. 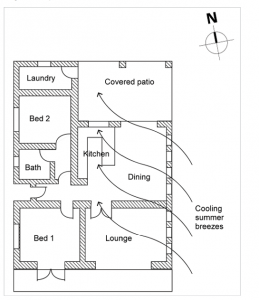 Designing your house to be well ventilated to allow winds to enter at a low point and push the hot air out via a high window is another basic method to cool your home. 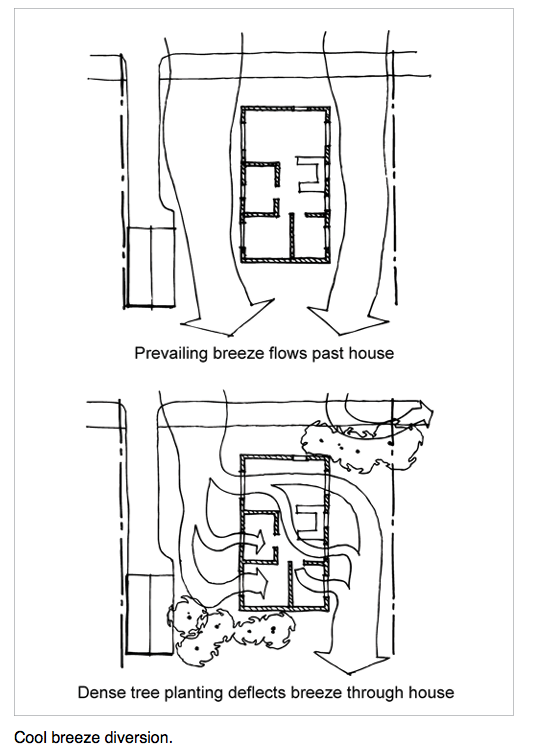 Cross ventilation having corresponding apertures that promote the cross flow of air between rooms will also contribute to a cooler more liveable home. A great deal of homes do not factor any of these simple well established concepts and instead really on costly and un-sustainable air-conditioning units, they close up their homes turning them into hermetically sealed boxes (basically giant fridges) and wonder why their electricity bills are through the roof.